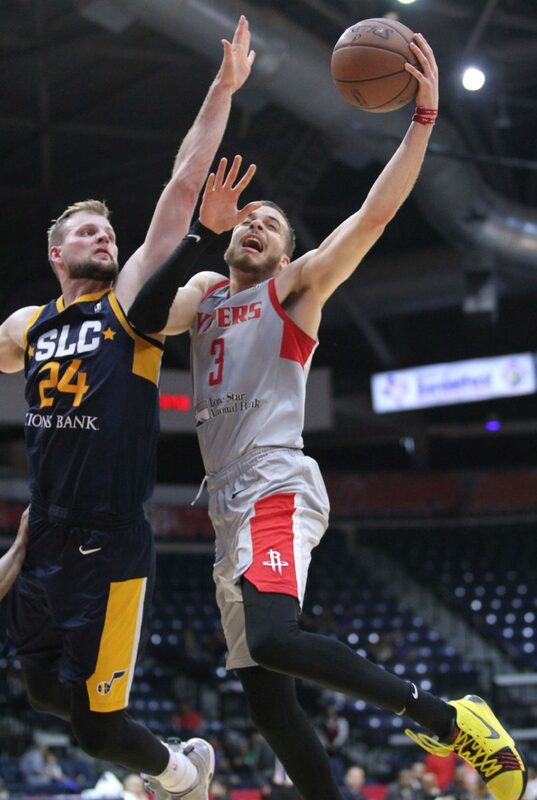 HIDALGO — The Salt Lake City Stars had already knocked down a season-best 22 3-pointers entering Monday’s final possession, and RGV Vipers guard R.J. Hunter thought they connected on No. 23. The Stars were inbounding the ball trailing the Vipers by three points with 2 seconds to play. Akeem Springs ran nearly the length of the 3-point arc, catching the inbounds pass on a sprint to the corner. As he turned and leapt to attempt the typing 3-pointer, Vipers defender Kevin Hardy was fully extended, blocking his angle at a shot. So Springs double-clutched, waiting for Hardy to fly past, before releasing his shot just prior his feet hitting the floor. The ball sank through the net as the buzzer sounded, and while Springs and his team began to celebrate, the Vipers bench implored the referees to check whether Springs’ foot was on the 3-point line. As the referees gathered around a video reply, RGV coach Matt Brase was already well on his way to the locker room. After taking about 90 seconds to review, the officials confirmed what Brase already knew: Springs’ foot was on the line, and the Vipers had won 132-131 at State Farm Arena. 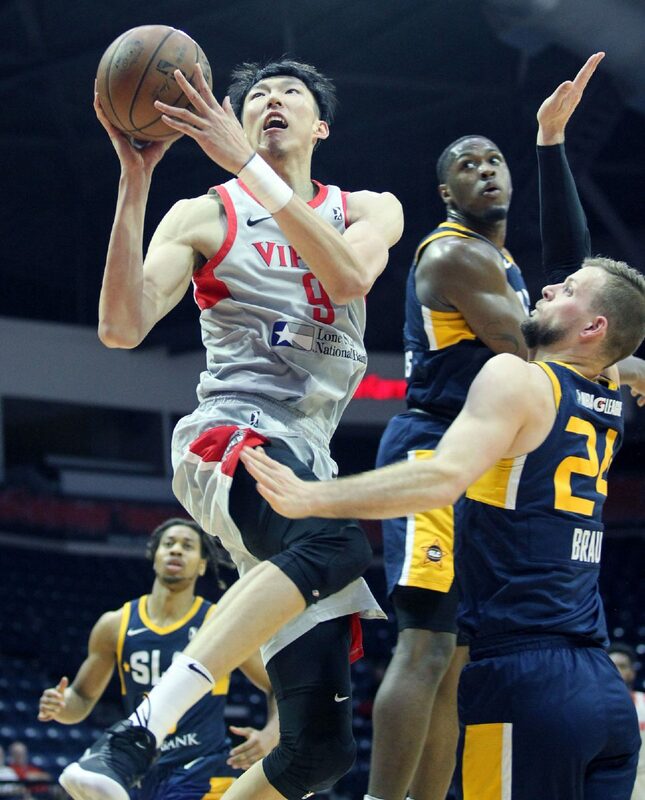 Rio Grande Valley Vipers Zhou Qi with a basket against Salt Lake City Stars Taylor Braun during the first half of an NBA G League game at State Farm Arena Monday March 19, 2018, in Hidalgo. Rio Grande Valley Vipers Chris Walker goes airborne against Salt Lake City Stars Naz Mitrou-Long during the first half of an NBA G League game at State Farm Arena Monday March 19, 2018, in Hidalgo. 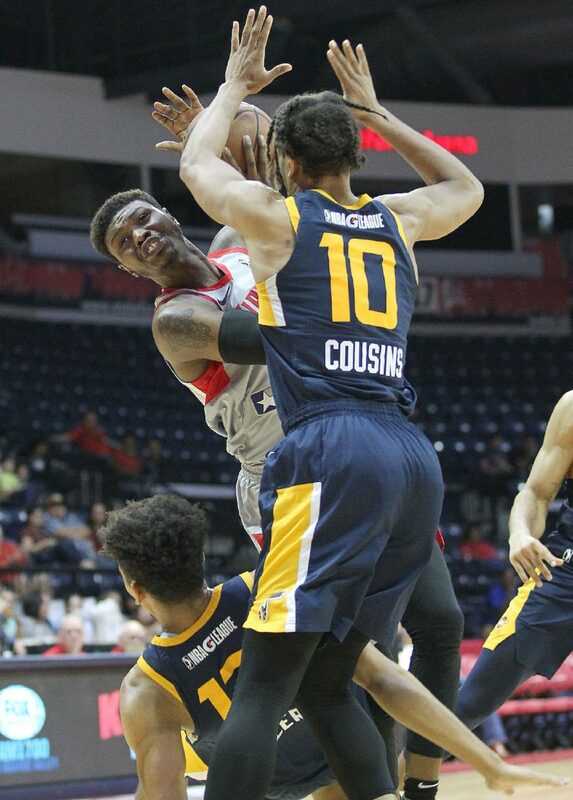 Rio Grande Valley Vipers Kevin Hardy defends against Salt Lake City Stars Diamond Stone during the first half of an NBA G League game at State Farm Arena Monday March 19, 2018, in Hidalgo. 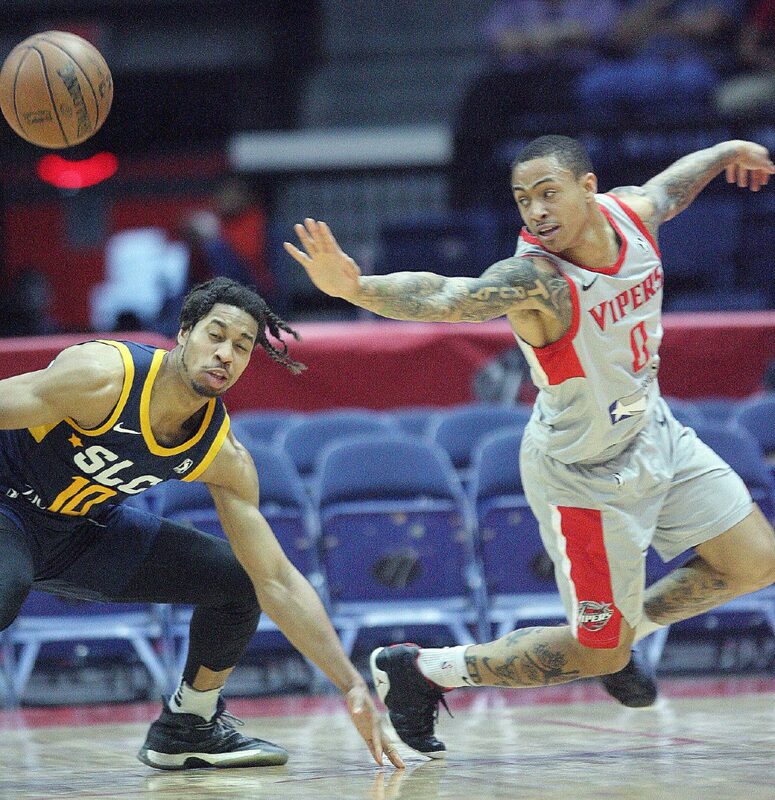 Rio Grande Valley Vipers Kyle Davis with a steal against Salt Lake City Stars Isaiah Cousins during the first half of an NBA G League game at State Farm Arena Monday March 19, 2018, in Hidalgo. 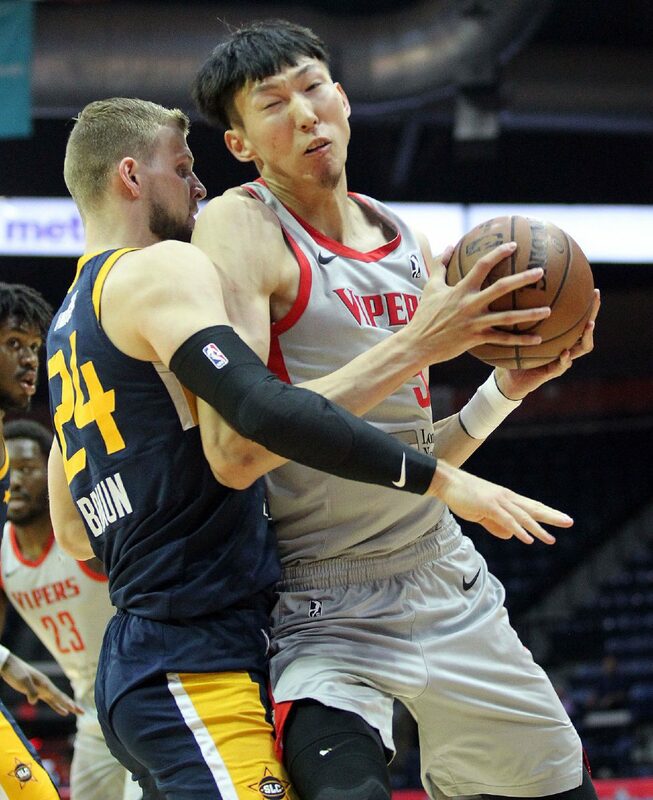 Rio Grande Valley Vipers Zhou Qi battles for position against Salt Lake City Stars Taylor Braun during the first half of an NBA G League game at State Farm Arena Monday March 19, 2018, in Hidalgo. 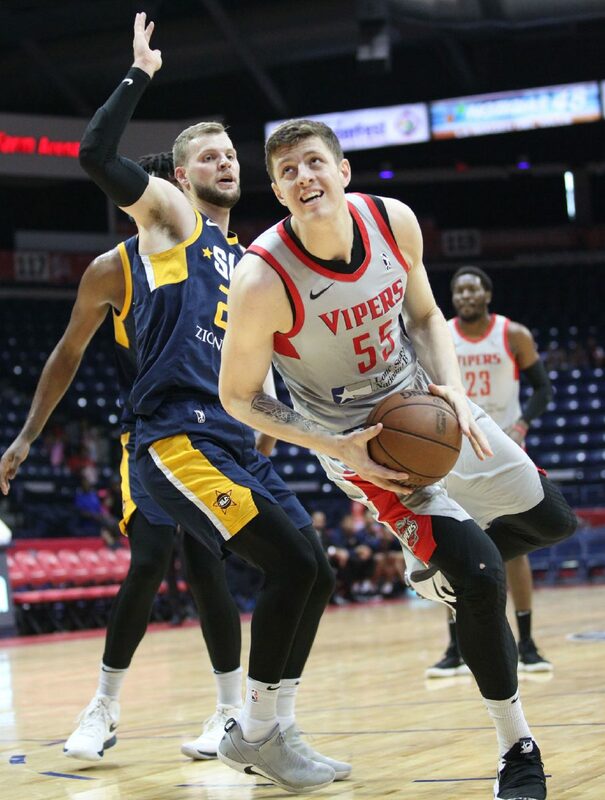 Rio Grande Valley Vipers Isaiah Hartenstein with a spin move against Salt Lake City Stars Taylor Braun during the first half of an NBA G League game at State Farm Arena Monday March 19, 2018, in Hidalgo. Rio Grande Valley Vipers Shane Richards is double teamed by Salt Lake City Stars Asauhn Dixon-Tatum and Akeem Springs during the first half of an NBA G League game at State Farm Arena Monday March 19, 2018, in Hidalgo. 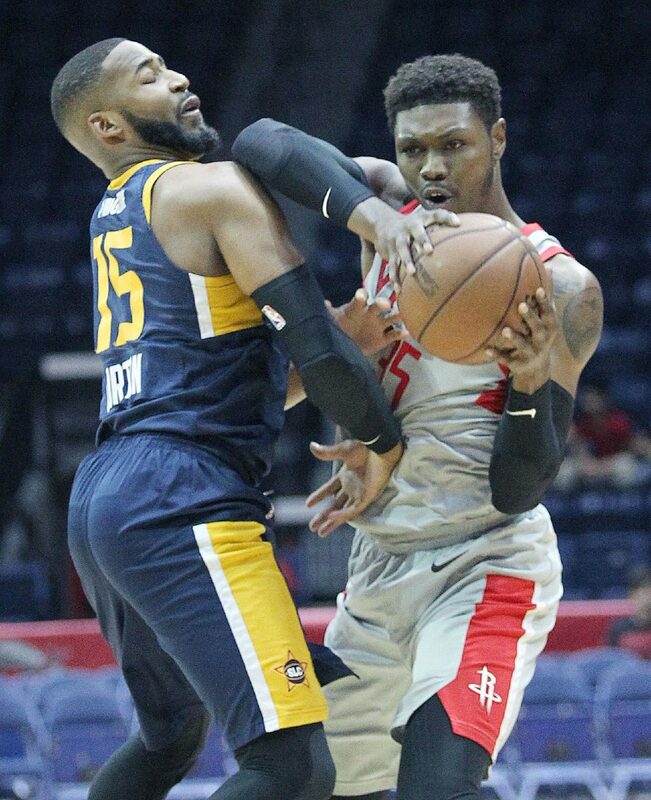 Rio Grande Valley Vipers Cleanthony Early is guarded by Salt Lake City Stars Deonte Burton during the first half of an NBA G League game at State Farm Arena Monday March 19, 2018, in Hidalgo. Rio Grande Valley Vipers RJ Hunter with a basket against Salt Lake City Stars Taylor Braun and Akeem Springs during the first half of an NBA G League game at State Farm Arena Monday March 19, 2018, in Hidalgo. 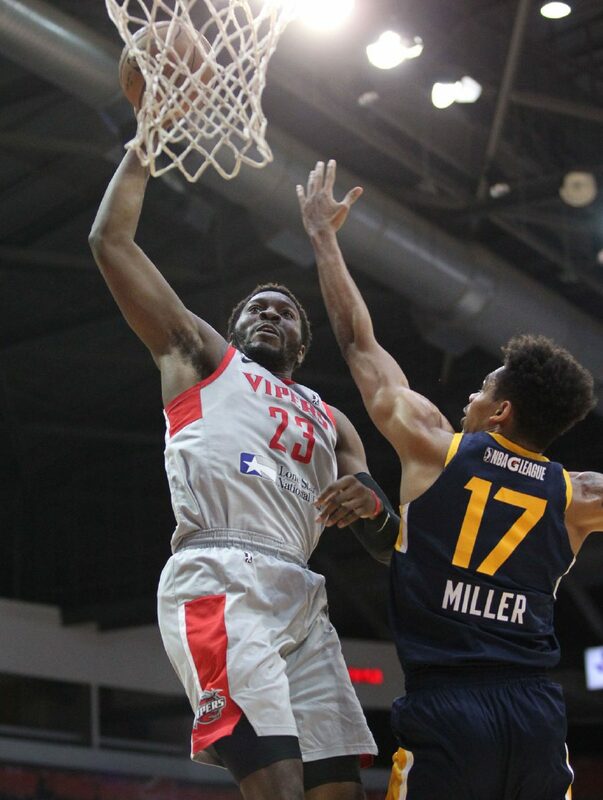 Rio Grande Valley Vipers Chinanu Onuaku with a dunk against Salt Lake City Stars Shon Miller during the first half of an NBA G League game at State Farm Arena Monday March 19, 2018, in Hidalgo. 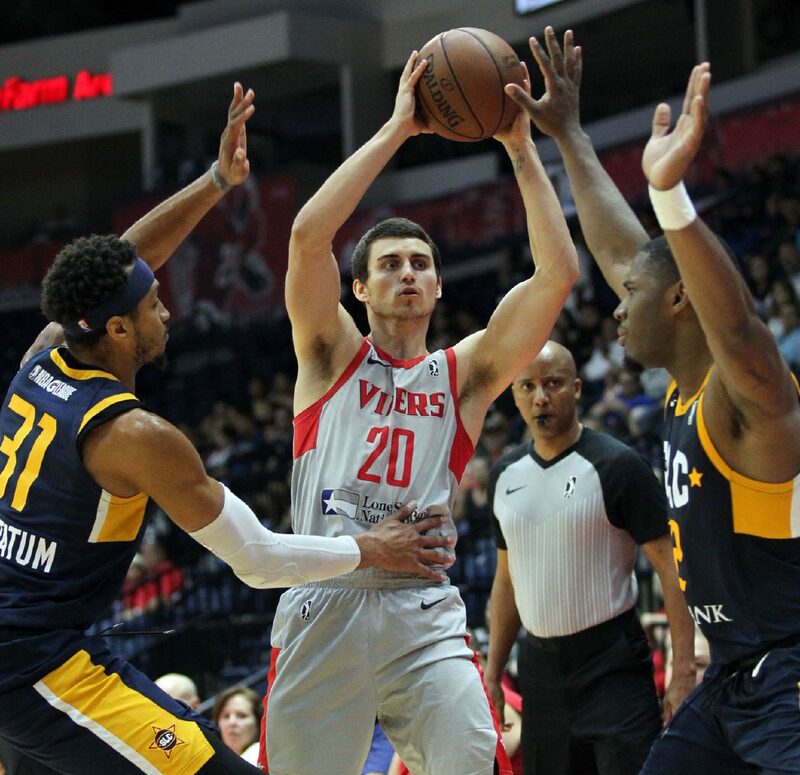 Rio Grande Valley Vipers RJ Hunter with a drive to the basket against Salt Lake City Stars Taylor Braun during the first half of an NBA G League game at State Farm Arena Monday March 19, 2018, in Hidalgo. Rio Grande Valley Vipers Chris Walker with a basket against Salt Lake City Stars Naz Mitrou-Long during the first half of an NBA G League game at State Farm Arena Monday March 19, 2018, in Hidalgo. 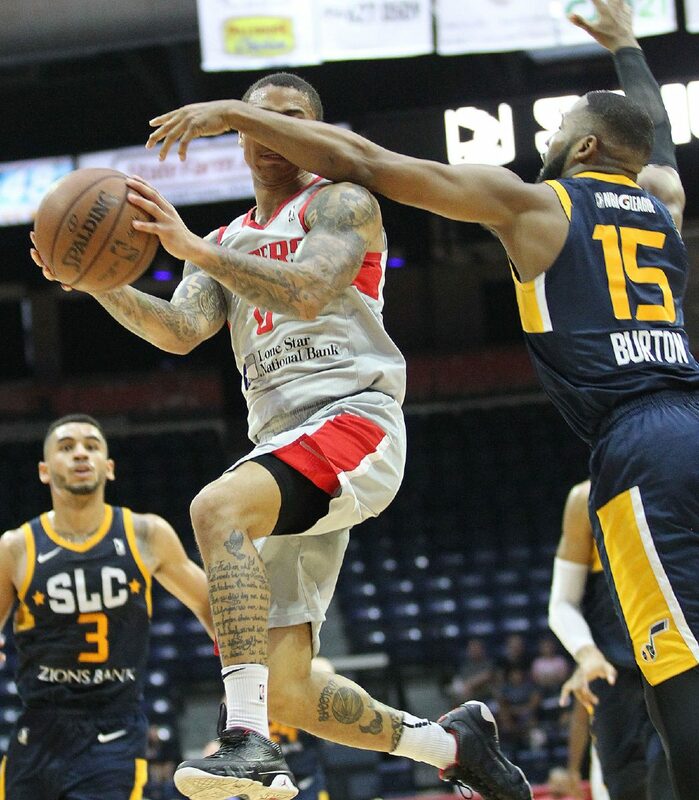 Rio Grande Valley Vipers Kyle Davis is hit in the face by Salt Lake City Stars defender Deonte Burton during the first half of an NBA G League game at State Farm Arena Monday March 19, 2018, in Hidalgo. Rio Grande Valley Vipers Cleanthony Early is double teamed by Salt Lake City Stars Akeem Spring and Isaiah Cousins during the first half of an NBA G League game at State Farm Arena Monday March 19, 2018, in Hidalgo. 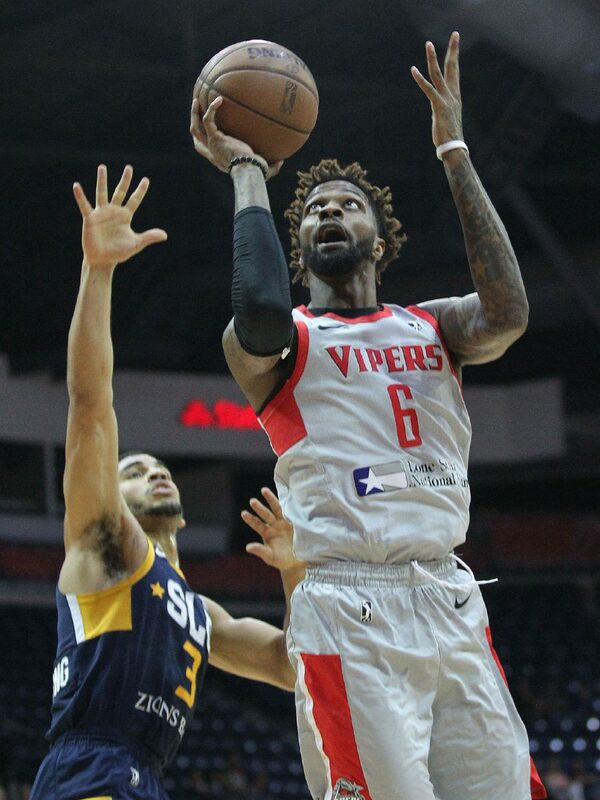 Hunter was again the star for the Vipers on Monday, as RGV’s leading scorer for the season netted 36 points. 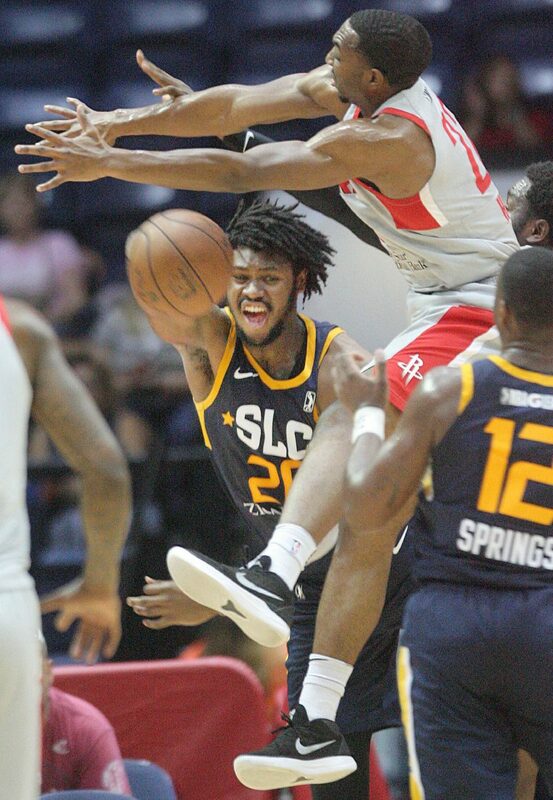 He knocked down 3s on back-to-back possessions at 3:20 and 2:32 of the final period to help RGV build a seven-point lead that Salt Lake City never fully erased. Hunter has scored at least 29 points in three straight games, shooting 55.9 percent from beyond the arc during that stretch after connecting on 7 of 11 from outside and 13 of 19 overall on Monday. He shot 32.8 percent from 3-point range in February — a mark he called “terrible” — but said he has rediscovered his form by keeping his feet more square to the basket on his release. Hunter also played a central role in the team’s defense down the stretch. With 17 seconds remaining and the Vipers up by three, Hunter was called for a foul trying to contest Naz Mitrou-Long on a potentially game-tying corner 3. Long hit 2 of 3 free throws, and a few seconds later he again had the ball in the same corner with a chance to tie. Hunter again went for a hard contest, this time blocking the shot with 3.9 seconds remaining. Mitrou-Long scored a game-high 37 points on Monday, connecting on 9 of 15 3-point attempts, including 8 of 9 through the first three quarters. The Stars as a team hit 22 of 42 (52.4 percent) from outside but made just 5 of 15 in the fourth quarter, including two of their final eight. The Vipers countered by shooting 58.1 percent from the field and 43.3 percent beyond the arc. Chris Walker, Chinanu Onuaku and Julien Lewis each scored 15 points, with Tony Wroten adding 13 along with 11 assists and six turnovers. Kyle Davis had nine points, 10 assists and two turnovers off the bench. Cleanthony Early played for the first time since Feb. 6 and scored 11 points in nearly 16 minutes. Brase said Early was on a minutes restriction as he recovers from a knee injury, while Isaiah Hartenstein (ankle) and Zhou Qi (illness) were also on a minutes cap. Hartenstein and Zhou both scored seven points in 14 minutes. Early said he was a little winded after the opening quarter but found his legs as the game went on. The win moves the Vipers to 27-20 — comfortably in position to claim a wild-card playoff berth. 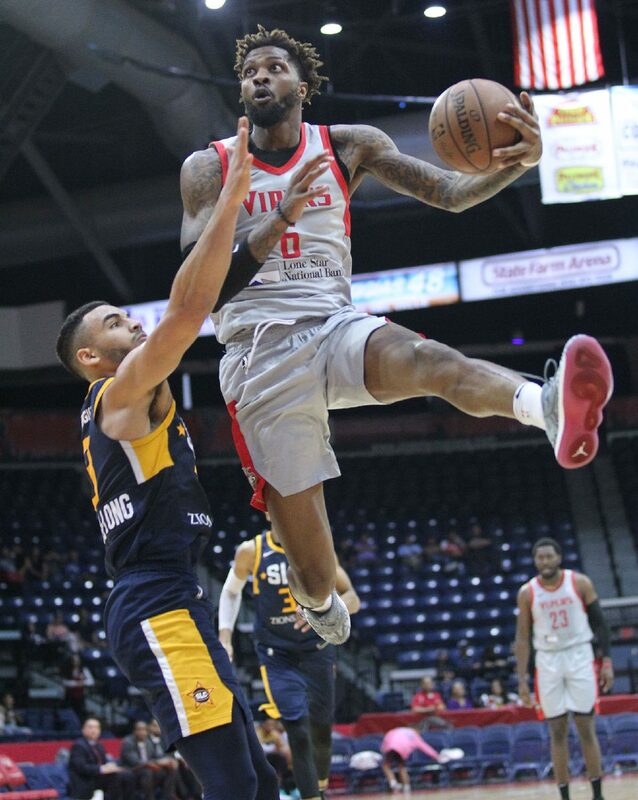 RGV can only miss the playoffs by finishing behind all of the Texas Legends (27-20), Reno Bighorns (26-21), Oklahoma City Blue (26-21) and Sioux Falls Skyforce (25-22). With only three games remaining in the regular season, RGV can lock up a postseason spot with either a win or a Sioux Falls loss. 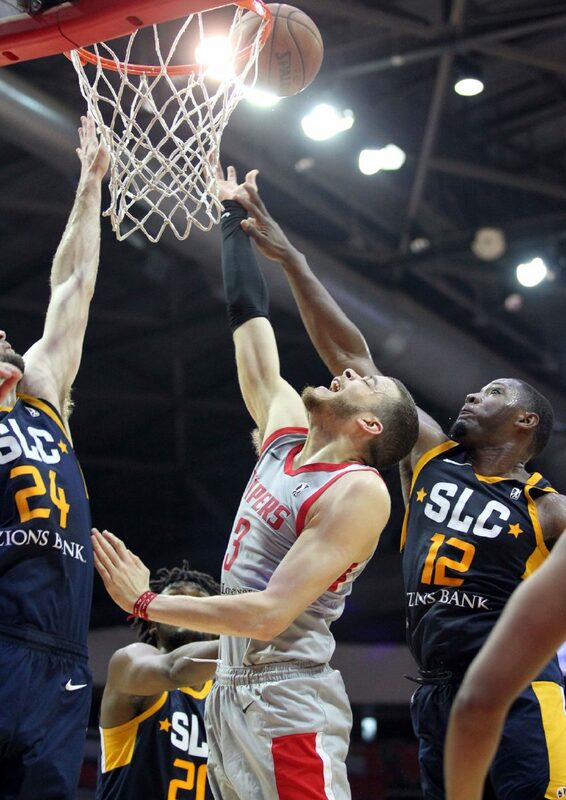 The Vipers won their season series against the Bighorns and Skyforce, lead the Legends 2-1 with a game to play and are even at one game apiece with the Blue with a matchup remaining. RGV hosts Salt Lake City on Wednesday, travels to face Texas on Friday and then closes out the slate at home against OKC on Saturday.